This may come as a surprise to some people (including you, dear Anonymous), but posting on my blog doesn't stop me from writing books. I am capable of doing both. Just like you are probably capable of showering AND finishing your homework. Or eating your Wheaties AND getting to class on time. Or writing testy notes AND flossing your teeth before bed. In fact, in the course of writing this blog, I often come across interesting ideas, events, or images that later make their way into my books. Take, for example, the photo above. It's not the product of Photoshop. This is what people all over Norway saw a few nights ago. 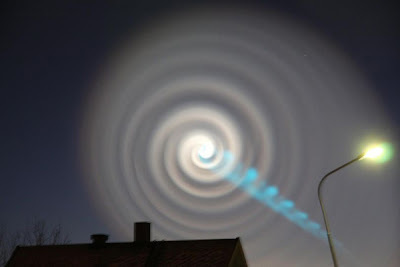 Was it a Russian rocket spiraling out of control (as some have suggested)? An alien encounter? A sign from a higher power? Who knows . . . maybe the answer will be found in my next book! Just kidding! pretty sweet, huh? Nuculear bombs?? Those things are pretty freaky. I found a news report on You Tube. Still, even if the cause is known, if I lived in Norway I would be freaking out big time. ~ AAAAAAAAAAAHHHHH!! The Apocalypse is upon us!!! BTW~ Unnecessarious is totally awesome. Make as many unnecessary posts as you want we( humble fans) dont care, acrually i look forward to your posts and im sad when you dont post so "Carry On, Fair Lady"
i think "anonymous" from last week needs to chill. also, take as much time as you like writing your book, i'm sure i'll be completely engrossed! i personally like all these posts. i love the randomness, every time you post it adds a brighter side to my day. Im sorry Kirsten that people r being rude. I love ur blog and i check it every day. its so sad when there isn't anything to read!! in fact, i probaly like the blog equally to the books!! besides, that post wasnt unneccesary at all! i liked it! Hey, Anna, if you look at 38 sideways it looks lie a guy with a mustaches. Anonymous; Do you realize that half of the people who read this site and have been for over a year might go nuts if she stopped posting? (No pressure Kirsten. ):) If she stopped, that may cause the world to end. I'm thinking Anonymous is very thankful for his or her anonymity right now. Kirsten - you know about the website etsy.com, right? (if not it's basically a website where people can post handmade crafts.) It usually makes me really jealous of others' talent but I've recently discovered another website, regretsy.com, that makes fun of the really stupid/badly made/WTF-worthy things you see on there sometimes. and keep up the amazing unnecessary posts! hey Ananka? is the picture you posted for the 'Bagged lunch anyone' from threadless??? Wow! That doesn't even look real, but the rocket hypothesis makes sense. But I a, confused because I live in the same time zone as NY and it's only 3:30 here and you posted this at 4:00. Are you on vacation or something? Don't be mean to poor Anonymous!!! she probably feels awful!!! I must concur though: the world would probably end if Kirsten stopped posting. But trust me, it would be my fault. If Kirsten stops posting I shall be bored and I will go crazier and probably have to build some large explosive item so I don't die of boredom and it will go off and the world will end. And trust me, u wouldn't want that. but i will put in some pretty colors so it looks pretty when it goes off. Any color suggestions? perhaps I could include fireworks??? I'm brazilian,and I love all your posts,and your books are my favorits! Kirsten: keep on blogging! i would die without your input of semi-regular randomness!!!!! Anonymous 7:04: to late, you already offered the penny. 2.THE WORLD IS SLOWLY BEING SUCKED INTO A BLACK HOLE. 3. WHEN PLANET X HITS, EARTH WILL BE PUSHED INTO THE SUN WHERE WE WILL DRINK LOTS OF SUNNY D.
4. I HAVE REVEALED TO MUCH. I MUST REST. When do I get my penny? MushroomCloud: You reminded me of a funny joke. okay, here goes. Imagine people with soot-black faces walking around looking dazed. MAN: "Yes, I know that everybody grieves in their own way Mrs. Moore but the cremation department did not enjoy the fireworks you put in husband's pockets." It was in a comic. HEY! Somebody read the bag lunch comments please. My friends all think I'm crazy when a come up with these random things. They thought i was especially weird when i was telling them about canned whole chicken!! :D IT was funny. thanks Kirsten!!! Hey! I've got an E-pal in Norway! looks fake. but when i lookd at it it looks like its moving side to side! 1. THE WORLD IS ENDING. 2. WHAT IS SEEN ON THE VID. IS ACTUALLY A BLACKHOLE. 4. (THE MOST LOGICAL IF I DO SAY SO AND I DO!) IT'S A BLACKHOLE AND WORMHOLE COMBINED AND THUS, THE WORLD IS ENDING STARTING WITH NORWAY. AND THEN CANADA! I'M KIDDING! I'M KIDDING! I WANT TO KNOW WHY EVERYBODY'S SO OBSESSED WITH DESTROYING CANADA. THEY HAVE GOOD BACON. AND FRIES. Ananka I agree with you. Writing on your blog helps you write well for other things aswell. And that photo is magnificent, I would have loved to see that! It could be to hypnotize people muahhahaha :) It's really interesting! Mushroom Cloud: Why not? The Anonymus is mean to Kirsten. I don't think anybody has been really mean yet either, besides Anonymus his/herself. Dear insulting anonymous, why are you so mad? Kirsten could take just as long for the book and not post, plus her posts are amazing i wouldn't want her to stop for like a year. Its possible that Kirsten is done or close, but now she has to edit it and work out things with the publishers these things can take a while. Also, she is working on another book, she's only human, so patience. p.s. kirsten I love your blog and your books keep writing.